One thing that I love about London is that it’s full of hidden gems waiting to be discovered. Well my friends… I may have just found one! And when I say hidden, I mean it. 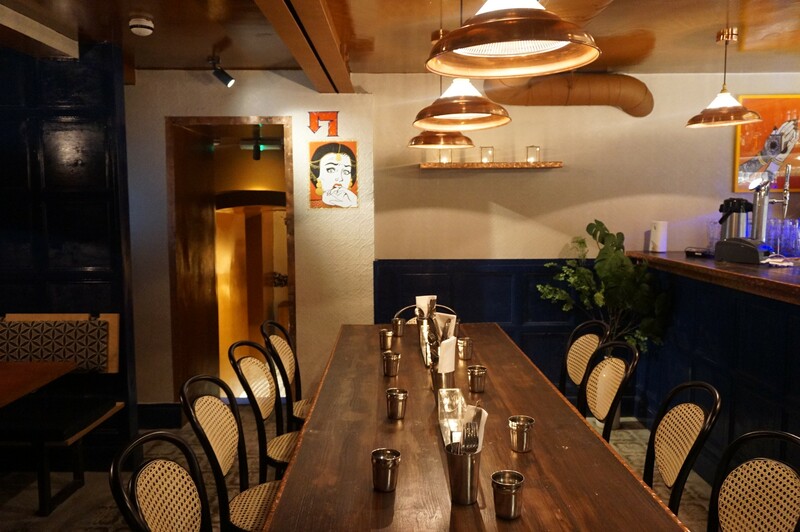 A single, mysterious door lies on Wardour St that leads to an underground world of food heaven! Welcome to Dum Biryani House. 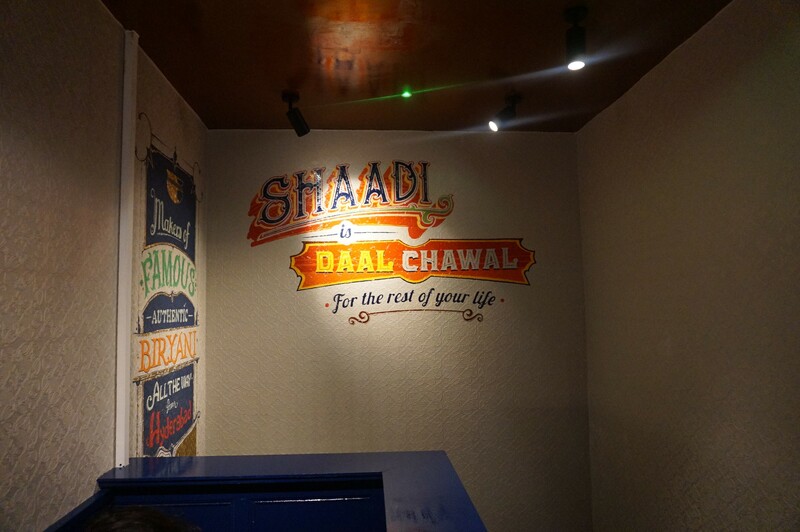 As you enter, you’ll find fun messages, Bollywood references and images all over the walls! We were greeted by their friendly staff and got ordering! One of the starters we opted for were chicken wings tossed in a hot and sour masala. The flavour of these really came through and they were delicious. The chicken tasted fresh and was not too greasy. Albeit being enjoyable, the wings lacked crispiness, which is something I prefer. 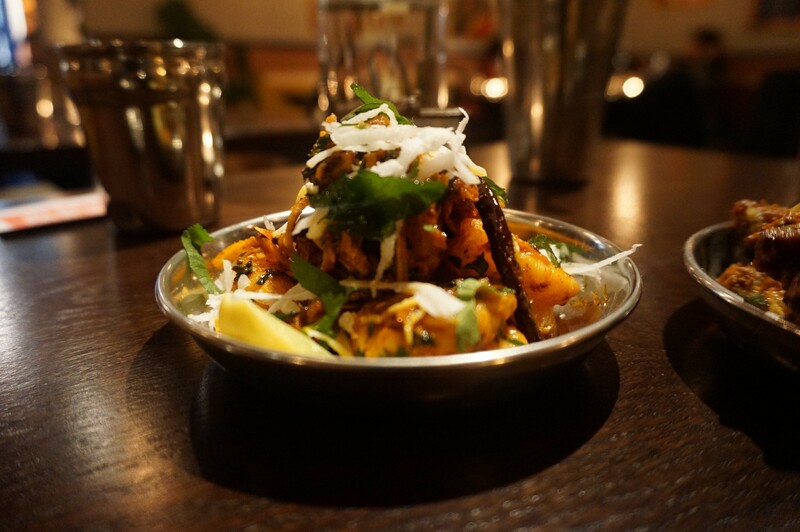 My favourite starter was the Andhra prawn fry consisting of stir-fried king prawns in red chilli and coconut. These were spicy and had me reaching for my glass of water numerous times hahaa, but not too spicy that it became unenjoyable. The subtle coconut added a gentle sweet taste that complemented the flavours really well. 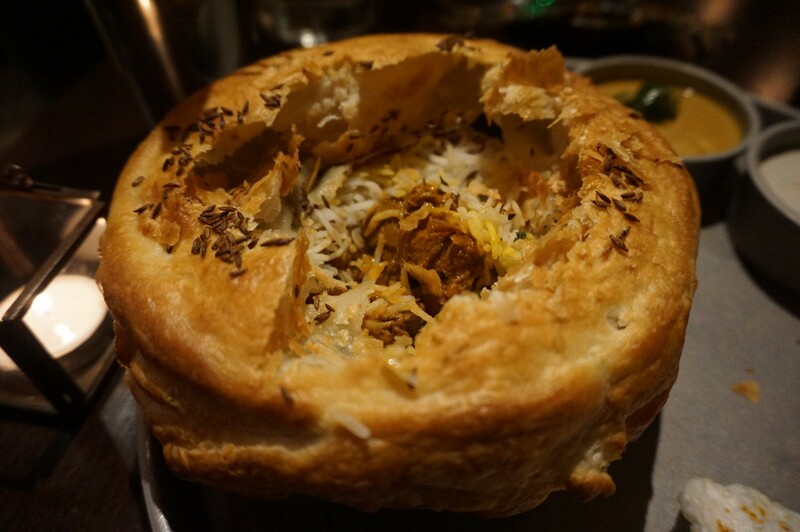 My friend R and I shared their lamb shank biryani, which comes with curry, smoked aubergine raita and papadums. Crack open the perfectly flaky pastry and ta daaaaa…. The smell of fresh biryani excites you. 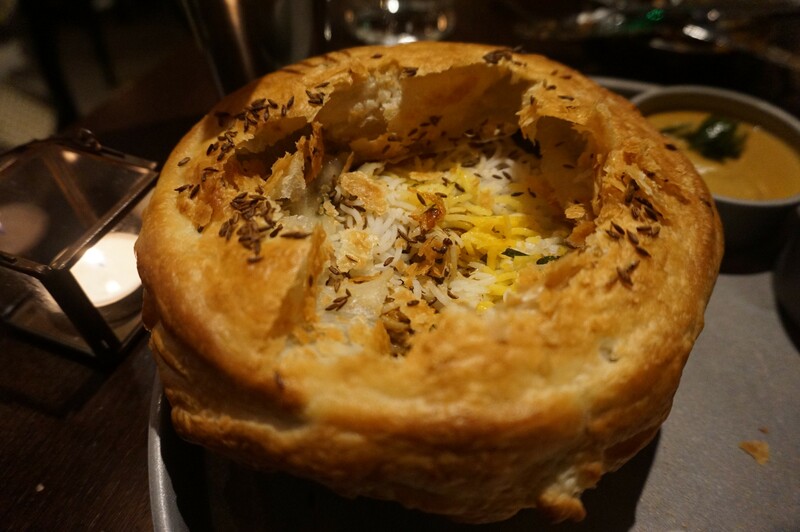 A hot and steamy bed of rice with plenty of soft and tender lamb that literally melts in your mouth. I don’t think anyone’s food will ever beat my mum’s or grandma’s, but this version of biryani definitely reminded me of a home cooked meal. 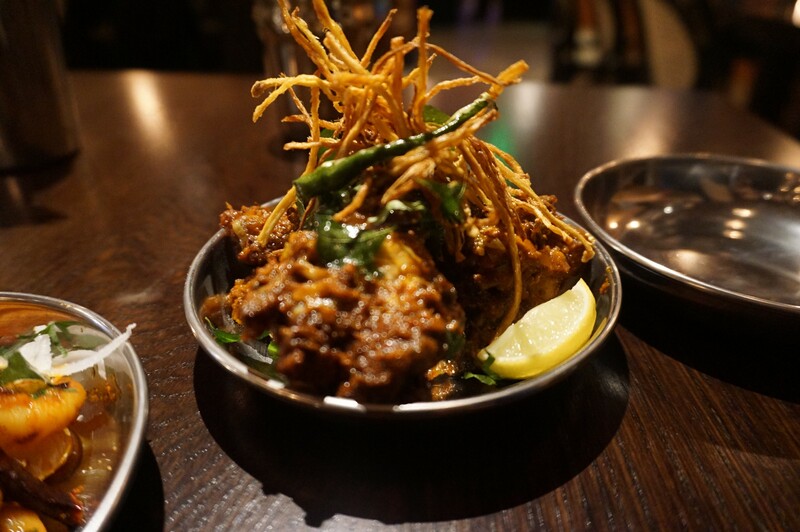 Dum don’t go low on spices, making their food more authentic than the majority of Indian restaurants in central London. 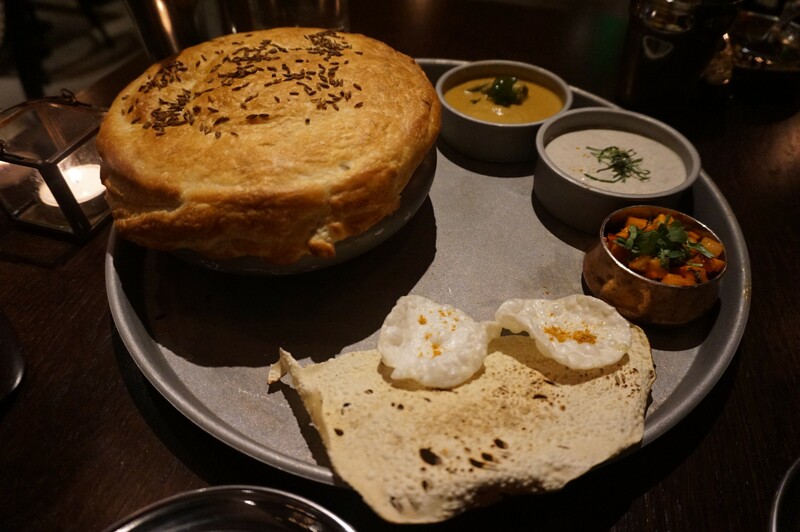 As for the sides, the curry was delicious, thick and creamy and had a slight peanut flavour. It had a hidden boiled egg inside which made for a nice surprise. 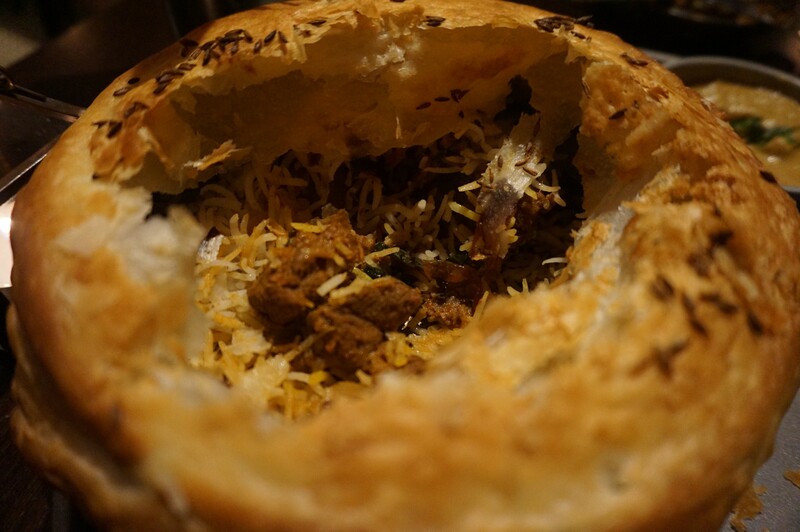 The aubergine raita was refreshing and took away the spiciness from the biryani. Overall the bill amounted to around £14pp including service which is good considering quality of food and location. 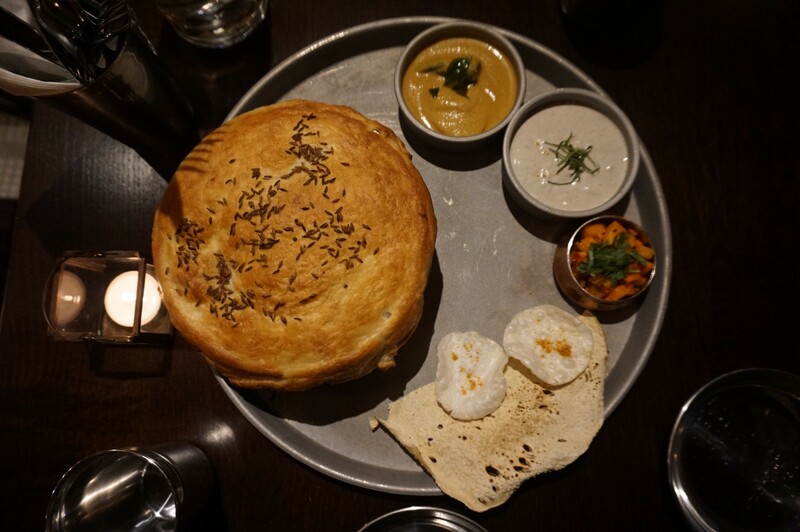 Dum Biryani House is a great restaurant to escape to from the cold weather after a long day of shopping and indulge in some warm, homely Indian food. (My parents pictured on the right when I say I want to quit uni and be a full time blogger LOL). The last picture hahahah great review ?? How is it £14pp when one main is that price and you had starters and service charge? This goes out to the girls in the front, back to the middle to the left to the right, ??? ?Pictures look amazing ? sounds fantastic! Need to visit here asap!